Over the past few years, many people have asked us what makes an original recipe. This is a fair question. Few recipes are not inspired at least in part by others -- whether the inspiration comes from a cookbook, a friend, or something you ate in a restaurant. Because of this, the line between an original (or acceptably "adapted") recipe and outright plagiarism is often blurred. Does substituting one ingredient for another make a recipe your own? How about rewording the method or introducing a new technique? On their own, these changes typically don't make an original recipe. A recipe becomes yours when you write it out in your own words, threading it with details that reflect your personal experience with it and your conviction that what you're presenting are all the right ingredients, as well as the best way to combine them. It's not about throwing in an extra tablespoon of ground cinnamon, but browning the butter before adding it to a cake batter, spreading it on a sheet pan to bake rather than in a tube pan, adding a glaze that you've come up with yourself. It's always best to show rather than tell, so we thought the best way to explain what makes an original recipe would be to walk you through the creation of one. My friend Sara recently brought a wonderful Asian-inspired chicken noodle salad to a picnic in the park, and afterwards I emailed her for the recipe. She sent me an enthusiastic response with no measurements and an abundance of delightful prose -- Sara is an excellent intuitive cook and never measures anything. I wanted to see if I could create my own original take on her recipe, so I set to work adding some new elements, re-writing it in my own words, and coming up with measurements and proportions for everything as I went. Below you can see the two different versions, along with explanations of some of my choices along the way. Toss together all of the veggies with a bit of sea salt and let them soften just a bit. ?I cook up a box of pad thai brown rice noodles. Make sure to rinse with lots of cold water after you’re done cooking them. Oh, and also, when they are cooking, I reach into the pot with my kitchen shears and cut the strands up, or else you'll have never ending noodles. This time I used some leftover rotisserie chicken. I just shredded it up -- super tasty. If I don't have that on hand, I'll just pan-grill some chicken breasts or thighs and shred those. It's extra tasty when I can grill the chicken on a proper grill and get the charred bits.? ?Then I just toss everything together adjusting the seasoning to taste. If I think of it and have some on hand, I'll sprinkle with some chopped peanuts before I serve. It will last a day or two in the fridge, so I usually make a big batch for leftovers. We met our friends Sara and Erik for a picnic in the park recently, and after about 45 minutes, we were surprised by a sudden thunderstorm and were forced to pack up our goodies and flee in all different directions. But just before the heavens opened, I managed to try a forkful of a delicious chicken and rice noodle salad Sara had prepared. She and Erik have recently cut out gluten, and she’s experimenting with a whole new slate of ingredients. Crisp vegetables, tender noodles and morsels of chicken were all cloaked in a zippy dressing spiked with lime juice, fish sauce and a hint of Sriracha, then showered with finely sliced mint and basil. As soon as we were home and dry, I asked Sara to email me the recipe, and this is my version. Add a Headnote: A good headnote gives context to the recipe and introduces the reader to your personal voice. This is also a good place to credit anyone who may have inspired you to create this recipe. In a wide, shallow bowl or other container, stir together the lime juice, brown sugar, fish sauce, chili garlic sauce, sriracha and garlic, making sure to dissolve the brown sugar. Add the chicken to the marinade and turn to coat the pieces thoroughly. Cover and marinate for 2 to 6 hours in the refrigerator. Add a New Element: Sara mentions pan-grilling or grilling chicken thighs in her version, but she doesn’t use a marinade. I chose the ingredients for this marinade to echo the flavors in the dressing. Make the Ingredient List Your Own: Sara didn't provide measurements for any of the ingredients, so I experimented until I felt I had the right ratio of vegetables, and a dressing that was tart and a little sweet but balanced. I added garlic to the dressing and cilantro to the salad, and I ramped up the heat by calling for a good amount of Sriracha and a whole (not seeded) jalapeno. 1. Combine all of the prepared vegetables (leaving out the herbs) in a large bowl. Remove the chicken from the refrigerator and let it sit at room temperature while you make the rest of the salad. 2. To make the dressing, whisk together the lime juice, garlic rice wine vinegar, Sriracha, brown sugar, fish sauce, sesame oil, walnut oil and ½ teaspoon sea salt. Taste and add more salt if you like. Set aside. 3. Bring a large pot of salted water to a boil. Toss the vegetables with a couple pinches of sea salt. 4. When the water is boiling, break the noodles in half and drop them into the pot. Cook the noodles according to the package directions, until they’re tender but still have a little bite. Drain the noodles and run them under cold water for a minute or two to cool them and keep them from getting gummy. Drain them again and add to the bowl with the vegetables. 5. Heat a grill or a grill pan to medium heat. Remove the chicken thighs from the marinade and sprinkle each lightly with salt on all sides. Start the thighs fat-side down on the grill, cooking for 7 minutes, until the fat is crisp and charred. Flip the thighs and cook for another 5 to 7 minutes (slice into one with a sharp knife to check that there isn't any pink remaining). 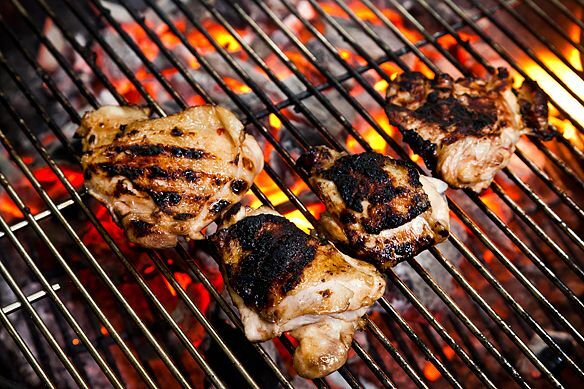 Once the chicken is cooked, remove it from the grill and set it aside to cool for about 5 minutes. 6. When the thighs are cool enough to handle, cut the meat off the bones and then slice it crosswise, so that each slice includes a little strip of charred, crispy fat. 7. Toss the vegetables and noodles with about two thirds of the dressing, and taste a noodle. Add more dressing if you like. Fold in the chicken and the herbs and serve. 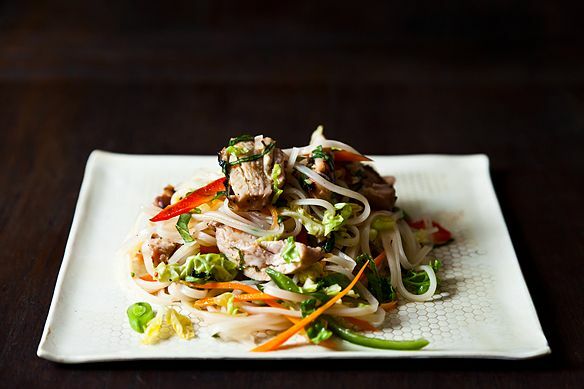 If you want to make this ahead of time, or if you end up with leftovers in the fridge, I recommend warming the salad gently before serving (cold rice noodles can get quite stiff). You can either warm the salad for 30 to 45 seconds in the microwave, or put it in a large sauté pan over medium low heat, tossing frequently, until it starts to loosen and warm, about 5 minutes. Tell People How to Make the Recipe in Your Own Words: I completely re-wrote the instructions, including the methods for cooking the noodles and grilling and slicing the chicken. (Sara shreds her chicken, but I like using thick slices with slivers of crispy fat attached; she recommends snipping the noodles right in the pot with kitchen shears, but I'm not nearly as dextrous as she is and found it easier to break them before adding them to the pot.) I also added my recommendations for saving and reheating the salad, which are different from hers. Do you think that I successfully created an original recipe? If not, share your thoughts in the comments section! That is not remotely your original recipe. It is clearly your friends. However, you are crediting her and she probably doesn’t mind. However, I don’t really think there are many truly original recipes. Apple pie is apple pie. I have the same question Haley A had (but no one seemed to answer it) how exactly would you use this if you're adapting a recipe you found online or in a book because like I'm doing the keto diet but sometimes when I find a really good recipe they're in non-keto stuff but can be adapted and I would really like to start a website or something about it. I have to disagree a bit— the chicken is definitely original, but I feel the noodles are still copied: yes, you changed some methods and minor ingredients, but I think that the elements that make Sarah's noodle recipe unique (the walnut oil, jalapeño, etc.) remain in yours. It mostly seems that, for that portion, you just lucked out on having a friend who doesn't incl. measurements when she writes. I would say you created a new recipe (the chicken) to be paired with Sarah's recipe (the noodles). I like aquamarine84's idea of calling this a "semi-original recipe", as opposed to an original recipe. How do i apply this if I am adapting a recipe I found online but altered? As a newbie at food blogging this article helped clarify so much! We all get inspired from different dishes so to be able to clarify where that line is and making it completely your own was a lot more simpler than I thought! Thank you for the wonderful article. I recently started a blog and I want to post recipes, but I really don't want to steal others recipes and adapt them. I want them to be original! So this article really helped clarify how I should approach creating recipes now ???? This really helps! I recently started a food blog, where I am planning to post recipes that my grandma had sourced ages ago. She used to maintain a handwritten book of recipes. I have no clue as to whether these recipes are her own/sourced from cookbooks/borrowed from friends. That worried me a bit. But this post really helps. Got my answers! Many recipes cantain such detail that home cooks of almost any expertise level can prepare them. How do you keep track of what you do while developing a recipe? Do you start with something written and make notes as you go along - such as ingredients and their measurements?, Do you sit down at natural breaking points and record your method from what you just completed? Do you write out the stages of building the recipe before you start or during the process or afterward, as you write the recipe? Maybe a sequel is in order! Very helpful and illustrative article! Thank you Merrill. This is definitely an informative article worth saving as a reference guideline. Thanks! I still like to give credit to the inspiration (wherever it came from) that preceded my version of the recipe. It doesn't take away from your work. I agree -- giving credit is NEVER a bad idea! Thanks so much, and sorry I missed you in NYC! This is the method I usually end up using when I try a dish that I love when traveling. Sometimes/usually , I end up with something completely different but a recipe I like and want to share. Language barriers also make for interesting "translations". I used to be terrified that I could inadvertently steal a recipe but I have learned that my own language, interpretations,measurements and trials make the recipe mine. Nice insight! I know on my blog one of my favorite and quickly becoming overused tags is "semi-original recipe" when I swap an ingredient out. It's good to have a more experienced recipe writer's thoughts.